Home » Featured Resource » Where’s My 2018-2019 Reach for the Stars Guide? 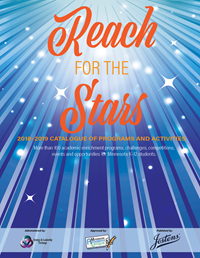 St. Croix Valley Gifted has a limited print quantity of the 2018-2019 Reach for the Stars Guide, the annual Minnesota student enrichment resource printed in partnership with Synergy & Leadership Exchange and Jostens. Reach for the Stars makes it easy for students to explore extra-curricular enrichment. All students are eligible for listed programs; need-based scholarships are available for several. Families can locate local resources that support student interests, dreams, and possibilities. Teachers in elementary, middle, or high school settings can identify programs designed for classroom implementation to support differentiated instruction or independent Flex Time learning. Counselors can match students seeking ways to explore personal passions to local opportunities. The Minnesota Academic League ‘ endorses each listing. Strategic partners include the Minnesota Department of Education (MDE); Minnesota Nonpublic Schools Accrediting Association (MNSAA); two Minnesota principals’ associations (MESPA and MASSP); Minnesota PTA; Metro ECSU; Education Minnesota; Minnesota School Boards Association (MSBA); and Minnesota Council for the Gifted and Talented (MCGT). Volunteer members of the St. Croix Valley Gifted board will deliver limited supplies of the print Reach for the Stars 2018-2019 to area school counselors, teachers, or PTA/PTO organizations upon request. You can also pick up a free print edition at an upcoming St. Croix Valley Gifted chapter meeting or download a digital version via our Enrichment Options page.